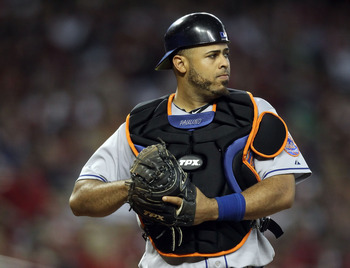 Ronny Leonel Paulino was born on April 21, 1981 in Santo Domingo. The six foot three catcher was originally signed by the Pittsburgh Pirates in 1997 at age 16. While rising through the ranks of the minor leagues, he batted .285 in 2004 at AA Altoona & then .306 overall in 2005 between AA & AAA. He was passed up as the Pirates top catching prospect by Ryan Doumit who was tearing up A ball with his hitting. That season Paulino made his debut with the Pirates appearing in two late September games. In 2006 he had his first full season due to injuries to the Pirates catchers. Paulino batted .310 with 6 HRs 19 doubles & 55 RBIs. Behind the plate he caught a league leading 38 runners trying to steal (36%) & was second with 72 assists. He also allowed a league leading 11 errors & nine passed balls (third in the NL). The next year he fell to a .263 average but had career highs in HRs (11) RBIs (55) doubles (25) & games played (133). In 2008 he became a back up catcher as Ryan Doumit took over the position after playing the outfield the previous year. 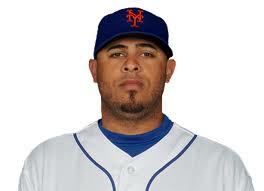 Paulino was also sent to the minors playing in just 40 games with the Pirates. In December 2008 he was traded to the Philadelphia Phillies for Jason Jaramillo. In March 2009 he got traded to the San Francisco Giants & the same day was shipped to the Florida Marlins for a minor leaguer. He spent two seasons in Florida, the first as a back up to John Baker. In 2010 he was the Marlins main catcher batting . 259 with 4 HRs 18 doubles & 37 RBIs, while posting a .991 fielding % throwing out 31% of runners trying to steal. He threw out 24 runners (5th best in the NL) but committed six errors (4th most in the NL) &allowed 53 stolen bases (5th most). His year started off well, first on April 7th in the second game of the season he singled in the winning run in the top of the 10th inning, in a game against the Mets at Citi Field. On April 10th he came in to bat as a pinch hitter in the 9th inning with the bases loaded & the Marlins down 6-4 to the Los Angele Dodgers. Paulino doubled scoring the tying runs as Jeff Cantu later drove in the game winner with a sac fly. On April 17th he hit a three HR leading the Marlins past the Philadelphia Phillies 5-1. He hit well enough to keep his average above .300 into early June. On July 17th he drove in both Marlins runs in a 2-0 win over the Washington Nationals. His season was cut short with an injury on August 19th. 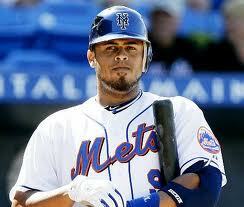 In December he signed a deal with the New York Mets. 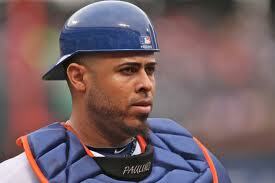 Paulino began the year at St. Lucie then at AAA Buffalo quickly making it to the Mets squad by the end of April. He would be used as a back up to Josh Tole playing in 78 games for the 2011 Mets. In his first Mets start he played all 14 innings of a game at Philadelphia & ended up being the hero. Besides gathering five hits that night, in the top of the 14th he doubled off Kyle Kendrick driving in David Wright with the winning run. On July 3rd he came into the game as a pinch hitter, then singled off Mariano Rivera tying up a subway series game at Citi Field in the bottom of the 9th inning. The Mets would win the game on Jason Bay's walk off base hit in the 10th inning. Paulino hit well enough through the year to stay above .300 into August. He finished the year batting .268 with 2 HRs 13 doubles a .312 on base % & 19 RBIs in 228 at bats. Behind the plate he threw out just 20% of runners trying to steal posting a .983 fielding %. He was granted free agency & signed with the Baltimore Orioles for 2012. He appeared in just twenty games behind O's backstop Matt Wieters (144 games) & Taylor Teagarden (22 games) seeing no ALDS action. In 2013 he played in the minors for the Orioles & Detroit Tigers. 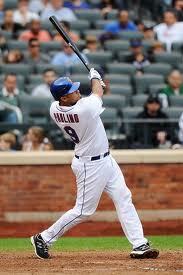 In an eight year career, Paulino hit .272 with 508 hits 33 HRs 93 doubles & 216 RBIs in 573 games. Behind the plate he caught 528 games throwing out 29% of would be base stealers.